As I drove to C-LINK Gallery, located at Brazee Street Studios in Oakley, Cincinnati, I realized I’d never actually been inside the building. I’d driven by it, once, while searching for an elusive community garden, and had noted the decaying Shepard Fairey paste-up on an exterior wall. The mural, installed in conjunction with Fairey’s twenty-five-year retrospective at the Contemporary Arts Center, was a beacon calling me back. I did impulsively return, later that week, arriving after hours and finding my hand hovering just over the handle, unable, as ever, to subvert the authority of a locked door. I knew I’d get inside on my third attempt. I had done the practical thing and called ahead. Having been away from Cincinnati for a few years, I had to reacquaint myself. I knew about Brazee Street Studios, which opened in 2009, but C-LINK was new to me. Created in 2013, C-LINK came into being as a means of connecting Greater Cincinnati artists with the regional community. C-LINK Gallery is a physical manifestation of this service, providing a professional exhibition space for C-LINK artists, affiliates, and partners. Curated by C-LINK Coordinator Chelsea Borgman, the Under 30 exhibit is a showcase of local millennials, designed to highlight “the diversity and talent among emerging artists of their generation.” The group show features work by six local artists in addition to Intermedio, a collaborative entity that uses art, design, coding, and music to create interactive, unpredictable installations. Intermedio’s contribution to the exhibit, titled “Voice Boxes,” incorporates wood, sound samples, electronic hardware, and computer code to create an immersive, show-stealing experience. The installation, created by Intermedio wizards Eric Blyth, Sam Ferris-Morris, and Justin West, along with an ensemble of singers, features five seemingly empty boxes from which voices emerge in staccato bursts of a cappella beauty and humor, like the soundtrack to some as yet unreleased Wes Anderson film. Here and there the quirky, dueling voices and harsh laughter are hushed as a sonorous refrain of “When you go to sleep” comes to the forefront, lulling its listeners into a dream-state before the next impish voice cuts in. Laughing at this, I backed up, slowly, and nearly joined an exclusive group populated by those who unintentionally destroy artwork. Only a week after a Taiwanese boy’s unfortunate stumble produced a fist-sized hole in a Paolo Porpora painting valued at 1.5 million dollars, I found myself bumping into a display stand featuring a ceramic piece by Didem Mert. The stand blissfully stayed upright, though, and “’Lil Cup” lives on, a prime example of the combined utility and sense of humor prevalent in her body of work. Surprisingly, Mert’s art takes two different forms. 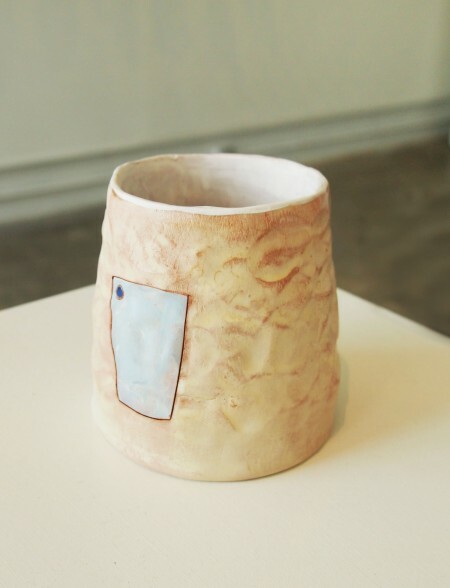 Some pieces tend to be stocky and textured, with bold lines demarcating each section, the result of which is an almost frumpy nonchalance that challenges the viewer’s assumption of what ceramic art should be. In contrast, several pieces—like “Nesting Bowls,” featured in the show’s promotional materials—are elegant creations, swooping and smooth, glazed with gorgeously unassuming tones. 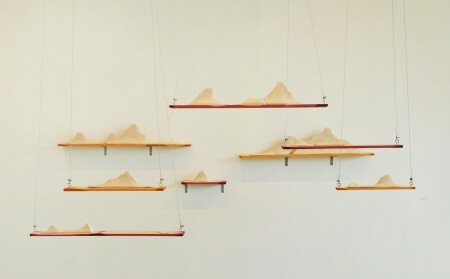 Positioned diagonally across from Mert’s ceramic pieces, Jessie Rienerth’s contribution, titled “Show Me Your Fault Lines,” features a number of ceramic ridges perched on wooden boards, most of which hang from the ceiling on steel cables. Though the piece physically dominates the space it occupies, it’s also conceptually tame, a series of horizontal lines broken up by what look like distant mountain ridges. The piece, while distinctive from its peers, offers little of the foreboding or sense of power associated with plate tectonics, and falls short of depicting the emotional scars implied by the title. Still, the technical ability is there, and it’s not difficult to imagine Rienerth nailing down her concept in future works. Hanging to the left of Rienerth’s installation is “Untidal No. 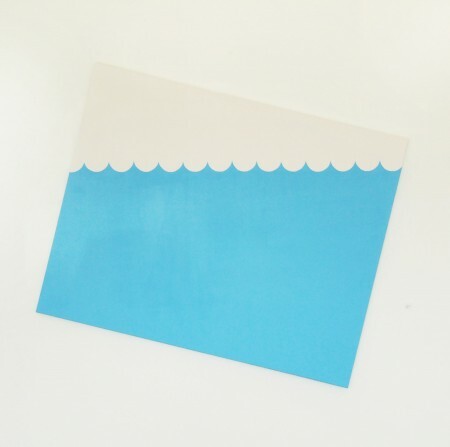 5” by Andrew Neyer, a minimalist acrylic painting angled sharply to the right, its blue waves level in spite of the canvas’ defiant tilt. The piece evokes an amusement park wave pool—a controlled environment made to look wild. 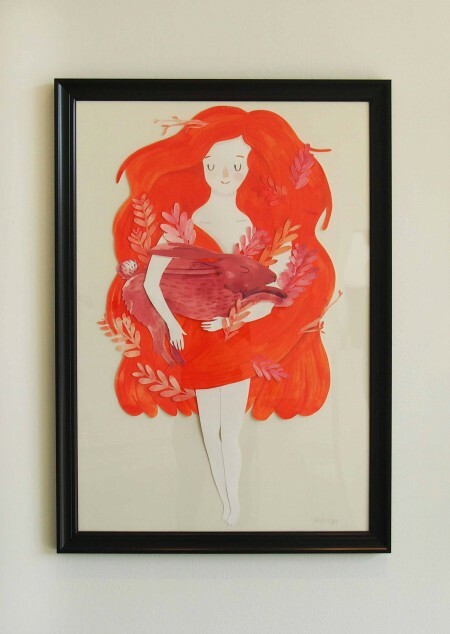 Neyer’s wider body of work is equally minimalistic, a cross between Eric Carle and editorial illustration. 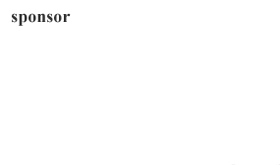 Fun, simple, and appealing, the piece is more safe than searching, a designation I imagine Neyer shrugging off with the carefree ease that radiates from his work. Scattered throughout the exhibit are the many acrylic, cotton thread, and micaceous iron oxide works of Laura Brooks. 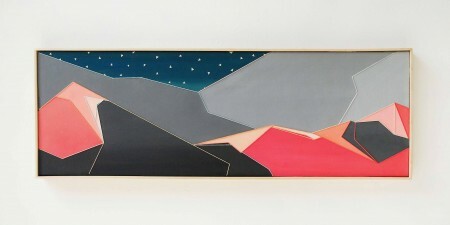 The images, semi-abstract representations of the Appalachians, are bathed in pink, gray, green, red, and blue hues. The mountains, sprawled under triangular stars, have preoccupied Brooks since 2010, the year she matter-of-factly claims to have “married” them. As these mixed-media works are part of a series, it becomes easy to skip over the less captivating images in order to view and re-review one or two personal favorites. I found myself returning several times to “Aunt Peach” and “Witch Sister,” images whose geometric shapes and colors combine in a manner that struck me as right on that day, at that time, in that room. Still, while standing in front of these pieces, even those I felt most drawn to, I began to wonder whether the thread, which makes her work so distinctive, was necessary at all. Was my two-dimensional bias, which has defined most of my artistic preferences since childhood, haphazardly cutting in to assert its will on a perfectly valid artistic choice, or would the piece look better without these border fences in miniature? After puzzling over this for a minute, I moved on. 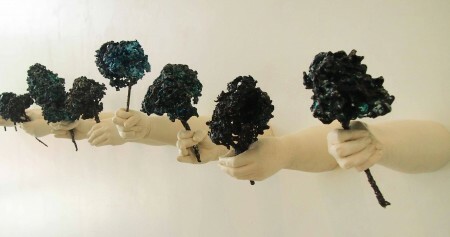 The final piece, “To Find You Is To Lose You” by Kendra Elyse Douglas, features fourteen Hydro-Stone-cast arms replete with aluminum hydrangeas. The installation, which impressively commands the better part of a gallery wall, was created by Douglas to “provide visual evidence of perseverance, comfort, mourning, and emotional understanding.” Hydro-Stone, a mixture of Plaster of Paris and Portland Cement, allows its user to employ the combined benefits of detail and durability. The hands, which grasp their bouquets in varying degrees of tightness, are graceful, lonely, and strong. The hydrangeas themselves are painted a metallic teal and are held almost defiantly, a rejection of time and an embrace of beauty, however fleeting. 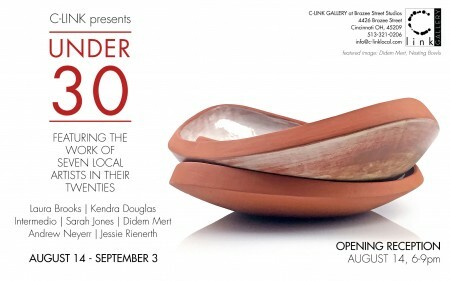 Under 30 ran from August 14 to September 3 at C-LINK Gallery, located at 4426 Brazee Street in the Brazee Street Studios. All photos courtesy of C-LINK Gallery. 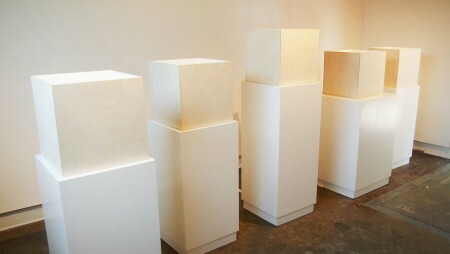 Current and upcoming exhibitions may be found at http://www.c-linklocal.com/c-link-gallery.